Receive Riches from Unexpected Sources! 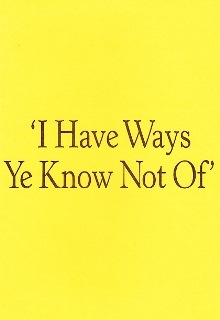 What did Jesus mean by I have ways ye know not of?  certainly not what most Christians think! Concealed within the Bible is the truth of miraculous wealth spelt out in detail by financier mystic S.B. Dyson. This booklets contents astonish! For here you will discover the miracle of riches from nowhere! Thousands have prospered from the mysterious power of sudden riches, concealed within Jesus saying! Whilst the ignorant believe money is the root of all evil, those initiated into the mysteries of the Bible know that precisely the opposite is true! This booklet declares that God wants you to be rich! By rich it is not necessarily a bank account overflowing with millions, mansions and yachts  though that is possible - but freedom from want and lack. and more! Your cup can runneth over! Within this booklet are examples of people who had no way whatsoever of landing cash windfalls! In other words the money appeared suddenly and inexplicably! But there is no mystery to this, according to author Dyson! for you can experience the extraordinary effect of Riches from Unexpected Sources. principles taught by Jesus, but in allegory. FOLLOWING THIS BOOKLET IS SIMPLICITY ITSELF. Whilst explaining profound spiritual principles, your part in it is both enjoyable and liberating. The truth shall set you free! To many, the Bible seems a book of tyranny with its admonitions and judgements. This is the outer literal expression of the Bible: the inner meaning has always been obscure except to initiates. This booklet makes the truth known. The truth is not cheapened or compromised by being advertised in this manner. On the contrary, Finbarr knows that only the chosen will choose it. SHOWING YOU THE WAY THAT JESUS AND OTHER MASTERS FOLLOWED. and liberating! Liberating in the sense that merely reading this booklet lifts a weight from one's shoulders! Here is the true teaching of Jesus on the matter of wealth! Those who equate spirituality with poverty have no idea  they have taken literally some of the Bible's passages, failing entirely to grasp their inner meaning. To suggest that God wants us to struggle is pure nonsense! We repeat: THIS BOOKLETS CONTENTS ASTONISH. HERE IS THE TRUTH OF IMMEDIATE RICHES. It doesn't matter how impoverished you are right now. It matters not how much you lack. Even if all seems lost: IT IS NOT SO. It tells the truth, demonstrating what you can do right now to change everything. And it is easy! You will find in this booklet some of the strangest examples of mystic manifestation. YOU ARE NOT MEANT TO BE POOR AND ALWAYS TO STRUGGLE  NO MATTER WHAT YOUR BACKGROUND OR CIRCUMSTANCES! You can live in comfort and without stress. You can find doors opening for you; opportunities appearing at every turn. God the Father opens doors, not closes them. The power of the Infinite is abundance itself. There is no shortage of anything. This booklet explains why people get it wrong - why they are saddled with debt, despair and anxiety. IT IS ONLY A QUESTION OF UNDERSTANDING. AND HOW YOU CAN BE OPEN TO THE MIRACULOUS POWER OF UNEXPECTED RICHES. Miracles did not end in Jesus time. What this booklet explains may seem miraculous, but in point of fact could become everyday life for you. Over 99% of the population is shut from the Infinite, because of misunderstanding. You can become one of the less than 1% who understands, and who can prosper with the Infinite! No superior education is required. No college degree. It matters not if you have never passed anything. And it matters not how lowly one's station may be. None of these things count! Infinite Intelligence does not judge! But it is there to express itself through you. PROSPERITY IS THE INEVITABLE AND AUTOMATIC RESULT! Ask yourself is this something you should try? Is there a way forward?